1. Time flies! Like I said I started college 6 years ago and it feels like it was just yesterday. Enjoy every moment, even the hard times, because (hate to break it to you) real life is 10x harder. 2. Get involved. Starting college can be overwhelming but try to get involved from the get go. Even though college is less "cliquey" than high school, groups still form and you want to be a part of (some of) them. 3. Don't feel like you have to Rush. Especially if you're in the South like me, Greek life feels like something everyone is doing and you may feel like you should too even if you really don't want to. Trust me there are PLENTY of people who don't rush and tons of other ways to get involved that are a lot less time and money. Plus, you can still be friends with people who do rush, it's not like you can't talk to your high school friends just because they join a sorority. 4. You will fail. In high school, I was one of the top students in a class of over 800 people. If I had known then how many times I would get a failing grade in college I might have said "well I might as well not go then!". College is SO different than high school when it comes to grades. There are curves and they want to make it insanely difficult so that you push yourself to crazy limits in order to learn a ton. I cried for a full week after getting a 50% on a quiz (not even a test, I LOL at myself now) only to make an A in the class in the end. You will fail, and you will be okay. 5. You might drop a class. Similar to #4, I would have NEVER imagined that I would have to drop a class. I did though and you know what I still lived and graduated on time. Plus there were people having to drop way more classes than one. It's another "normal" thing in college so don't freak out if you get to that point. Your GPA will thank you if you drop a class over getting a D or F on your transcript. 6. The bathrooms aren't that bad. As an only child I had never shared a bathroom with ANYONE for my entire life and next thing I know I'm sharing one with 30 strangers. I was concerned about this going into it but turns out - not bad at all! They cleaned them twice a day everyday and were surprisingly not crowded. There were 2 showers and my roommate and I would always go together so a stranger wouldn't be in the other shower for either of us. It wasn't bad at all. Just make sure you have: shower shoes, shower caddy, and a robe. Don't forget your towel! 7. It will feel like everyone is drinking but you don't have to. I'm an extremely stubborn person so I never felt like I *might* give into peer pressure in terms of drinking, but I know a lot of people do. You're only 18 when you're starting college so you obviously *shouldn't* be drinking but of course so many people do. It doesn't make them cool or special, you won't be cool or special if you join in either. Just don't feel like you have to is all I'm saying. People WILL try to force the issue, but they'll get over it very quickly and you CAN still have just as much (or more!) fun being sober! 8. Create a workout schedule from day 1. The freshman 15 is so real its scary. More freedom and more food within walking distance then you've ever had before = weight gain. Plan out which classes you can attend at the gym and find a buddy to go on runs or workout with a few times a week. You'll have more energy and look great while avoiding the dreaded freshman 15. 9. Sit in the front of the class. You'll easily get distracted by Youtube, your phone, or your friends sitting in the back of a 500 person lecture hall. Sit up front, ask questions, pay attention. One hour of focus can really reduce the amount of studying you'll have to do later! 10. Go to office hours. Professors or TA's will offer office hours 1-2 times a week where students can come and ask any questions or get help on assignments. It's kind of like a study hall because other students will be there at the same time with you. I didn't start going to these until senior year!! What a regret - they helped so much and having the professor or TA (who usually grades the exams) know your name and face can make a difference. I'm sure they'd argue otherwise but the fact they know you and know you're trying means something. 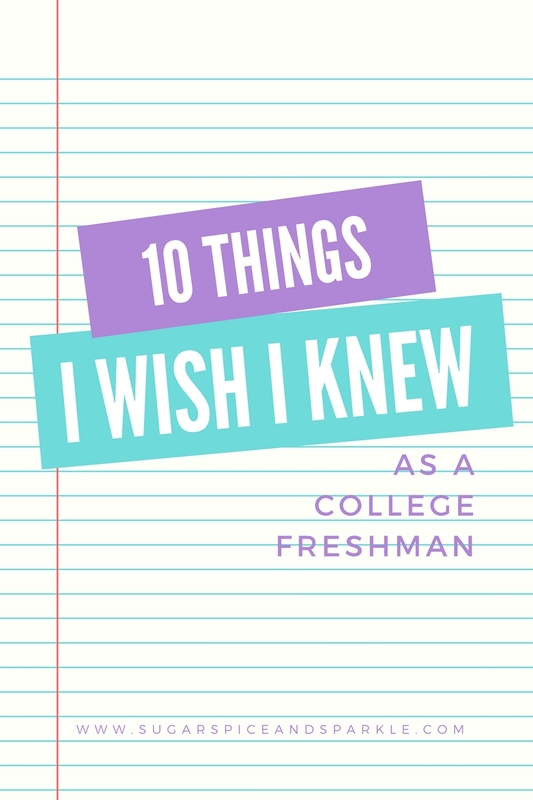 Are you headed to college for the first time? Leave me any questions in the comments and I'll help you out in any way I can!